Automotive fuel delivery system transfers fuel into vehicle’s combustion chamber. Further, intake manifold, air filter, fuel injectors, PCM/ECM, wiring harnesses, airflow meter, fuel filter, fuel pump, fuel tank, fuel lines and pressure regulator are components of a fuel delivery system. Global automotive fuel delivery system market is predicted to grow at a satisfactory compound annual growth rate (CAGR) over the forecast period. Global automotive fuel delivery system market is mainly expanding on the back of expanding automotive market. 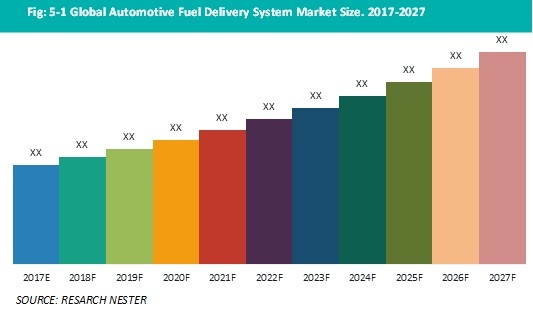 The market of automotive fuel delivery system is projected to reach at a notable valuation by the end of forecast period. The world is witnessing continuous growth in automotive industry. Population across the globe is purchasing new vehicles owing to their comfort and standard needs. Rising sales of passenger cars globally is the major element which is propelling the growth of automotive fuel delivery system market. The increasing sales of vehicles in developing countries such as China, Brazil and India are the main factors likely to boost the growth of market across the globe. On the basis of regional platform, global automotive fuel delivery system market is segmented into five major regions including North America, Europe, Asia Pacific, Latin America and Middle East & Africa region. Asia Pacific is accounted for the largest market of automotive fuel delivery system. Further, Asia Pacific is leading producer of automobiles and is also the major market of original equipment manufactured automotive parts. Additionally, Asia Pacific automotive fuel delivery system market is expected to continue its dominance during the forecast period owing to a number of factors such as swelling disposable income of the consumers and increasing number of vehicles on road. According to International Organization of Motor Vehicle Manufacturers, China alone produced 24,420,744 cars and 3,698,050 commercial vehicles in 2016. Moreover, high production rate of vehicles in Asian countries is a major factor which is likely to intensify the demand for automotive fuel delivery system in Asia Pacific region over the forecast period. Furthermore, by vehicle type, automotive fuel delivery systems are further segmented into passenger cars, light commercial vehicles, heavy commercial vehicles. Rapid expansion of urbanization is resulting in increase in the number of passenger vehicles in developing and developed countries. The rising sale of passenger cars across the globe is one of the major growth drivers for the passenger car segment in automotive fuel delivery system market. Rising sale of automotive across the globe is the major factor driving the growth of automotive fuel delivery system market. Factors such as, changing consumer life style and rising preference for comfortable ride are escalating the sales of automotive across all regions. Factors such as growing automotive industry and this rise in sales of automotive vehicles are expected to foster the growth of automotive fuel delivery system market over the forecast period. Factors such as, rising vehicle production and increasing demand for engine with high efficiency are likely to escalate the growth of global automotive fuel delivery system market in upcoming years. Rapid enhancements in transportation infrastructure and changing life style of consumer are key factors which are augmenting the production of new vehicles across all regions. This factor is expected to bolster the growth of market over the forecast period. Today, vehicle’s life span is very long and due to this demand for automotive replacement parts is increasing. Further, global automotive industry is booming on the account of urbanization and increasing disposable income. This massive growth of automotive industry is widening the demand for automotive fuel delivery system. Moreover, automotive aftermarket business is anticipated to grow at a robust pace during the forecast period. For instance, according to Indian Brand Equity Foundation, India automotive aftermarket is anticipated to reach USD 13 Billion by 2020 from USD 8.4 Billion in 2016 and is likely to flourish at a CAGR of 10.5% during 2016-2020. Thus, growing automotive aftermarket industry is expected to bolster the growth of global automotive fuel delivery system market over the forecasted period. However, high cost associated with replacement of automotive fuel delivery systems is a restraining factor for the growth of automotive fuel delivery system market in near future.